Isn’t their a 9x18 loading similar to that one, only loaded with darts? Interesting. Not the first, nor the last. Hope springs eternal. A few problems with the concept, not the least of which would be getting ATF&E approval for a commercial version. Three seperate projectiles from one pull of the trigger, and all that. On another Forum there’s a discussion about a two-barrel semi auto supposedly under development. Actually two seperate pistols welded together on top of a single frame. Similar problems as above. 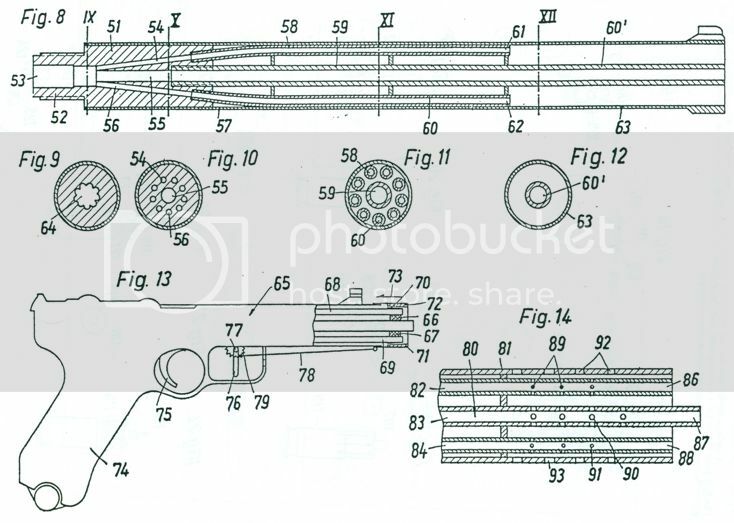 The SPIW project included an entry by H&R that comprised a three barreled rifle, shooting three seperate flechettes, encased in a plastic triangular “case” fed via a plastic “belt”. It worked after a fashion but was quickly rejected as being impractical and dangerous. Photo of a “cartridge” below. Matt, similar cartridges and weapons of this type were developed by Hans-Ludwig Schirnecker in several configurations. I’m aware of 9 x 19 mm cases loaded with five and seven projectiles. Jan Franzen has emailed me, and apparently the cartridge and modified 1911 are the result of some Czechoslovakian experiments in the 1960’s & 1970’s to do with caseless ammunition, and triplex caseless ammunition. 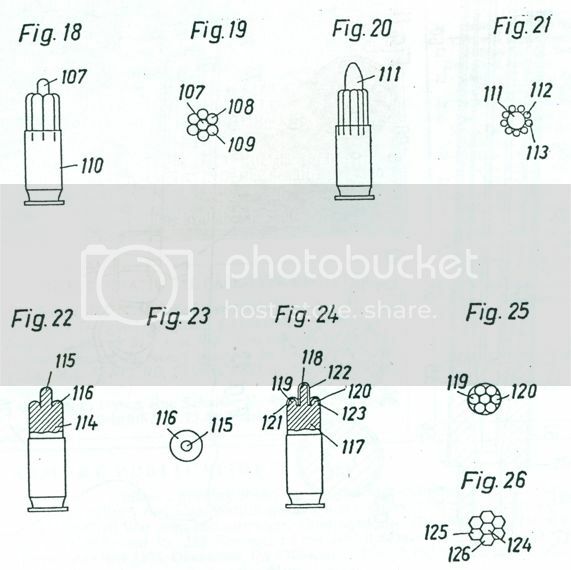 The cased versions were something like a proof of concept trial to see about the functioning of the gun, and the ballistic data on the projectiles. 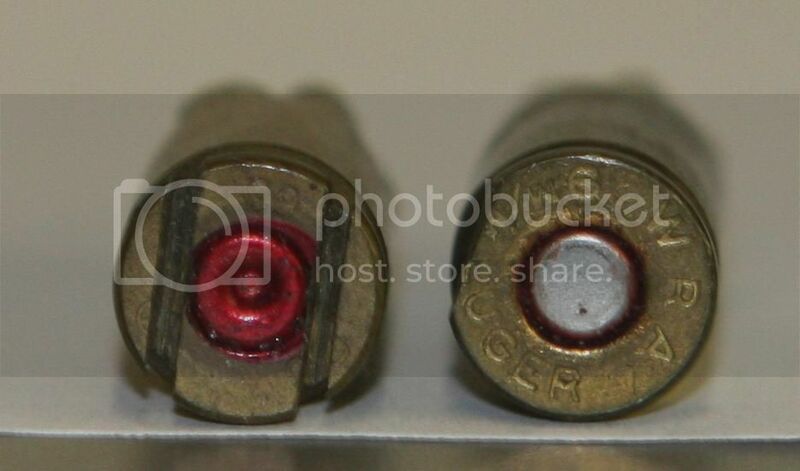 It seems the project did not get out of the experimental phase, and all of the caseless cartridges, and the metallic cased test .45 auto triplex loads with flat rim edge are all gone / or are very rare. (assuming Google is properly translating the Slovakian article which Jan sent me). I would just wonder why the East-Bloc Czechs would be experimenting with US .45 ACP? Fede, Schirnecker did make multibullet cartridges in both 9mm and 45, but the only ones I know of are 5 or 7 bullet loads. The 9mm were tested in a Luger with multiple (7) seperate barrels by both Colt and DAG who loaded some ammo. I believe the round you picture has an FN headstamp I belive. If so it had nothing to do with Schirnecker. I have what looks like an identical load, including the cms on the case. I picked mine up at the FN Lab in the 1970s. There is also a similar round with four projectiles. They were made as a joke-handouts to people who visited the lab. At the time they (the FN Lab) were testing small caliber rifle bullets. 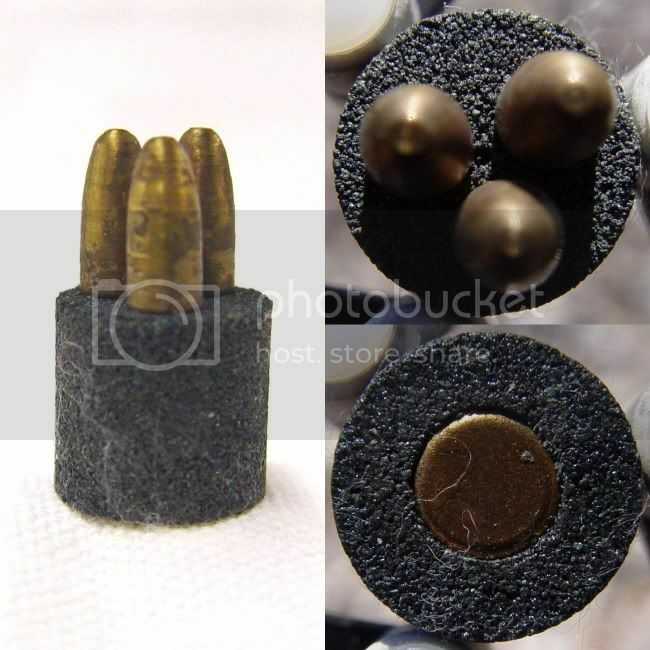 Some of these were loaded into 9mm cases with a nylon (I think)filler in the case to center the bullet with what looked like a steel washer in front of it. These were used to simulate the downrange ballistics of the bullets. I have several of these in the collection that came from the Lab. 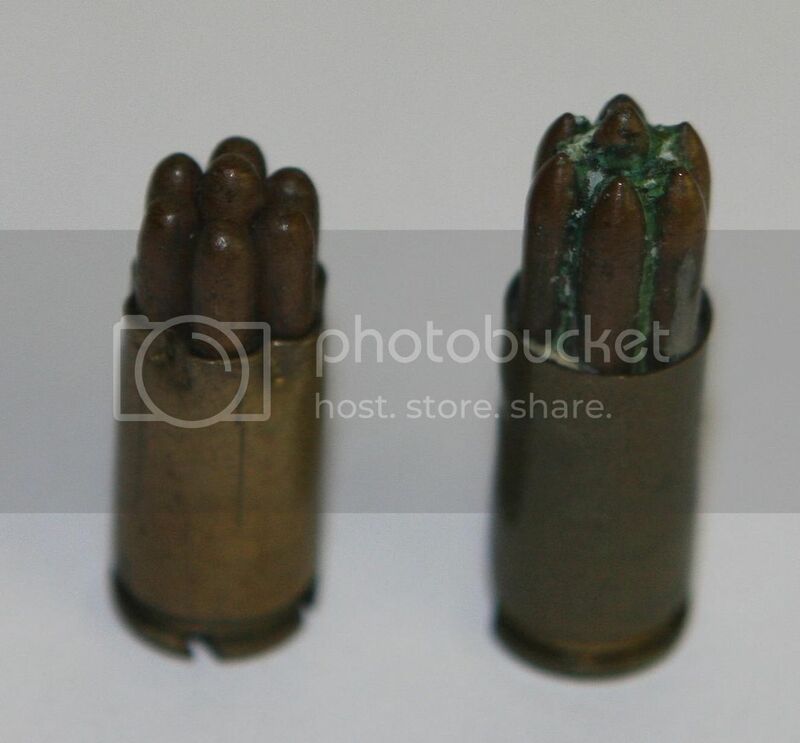 The one you picture (if it is what I think it is) were made up by stuffing left over bullets in old cases and crimping them in. The triplex loads like (?) the one you picture are distorted and would not even chamber in a 9mm weapon. In the last 20 years I have seen these frequently misrepresented. I’m not surprised someone is now calling it a Schirnecker design. 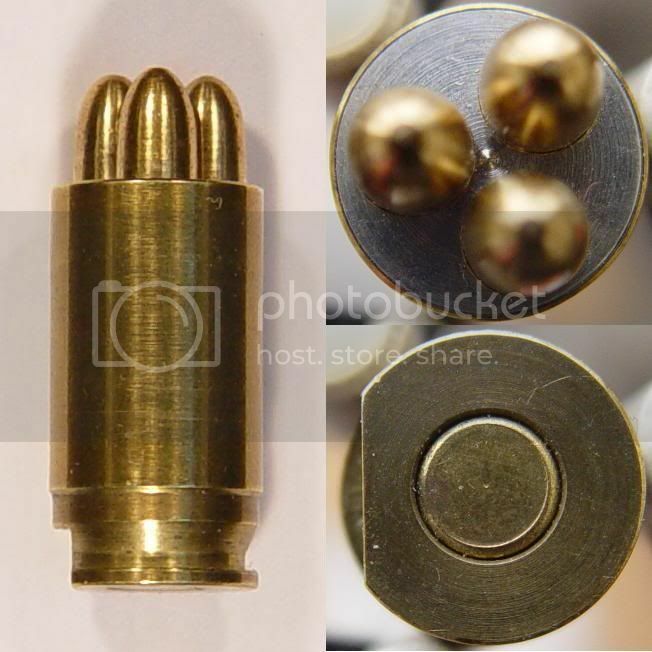 Has anyone seen any source data that Schirnecker made triplex rounds in 9mm? The article I have also makes mention of what looks like a 9mm Makarov or 7.62 Tokarev type gun, which would seem more appropriate. It may be that the .45 load was easier to work with at first given the large diameter? Sorry - no 7.62x25 or 9x18 looking cartridges are shown in the article. Lew, you are absolutely right, I confused the 5 bullet load with this FN triplex cartridge because it was included in my Schirneker files. It’s headstamped FN 52 and loaded with three 3.5 mm bullets but I don’t have any more information about it. I picked up one of these cartridges recently and it’s darn interesting looking. 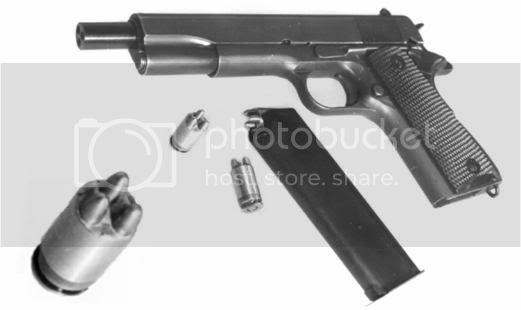 I would love a better copy of that picture of the pistol with the barrel etc. - do you remember which file it was in at Wooding Lab? Bill can’t remember at the moment. 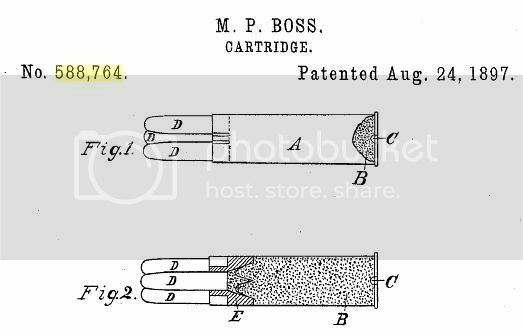 Anyway, Woodin Lab has no example of this cartridge. However (as per usual), Bill remembered something similar and showed me a Czech caseless experimental bearing a striking resemblance to the original brass case item. 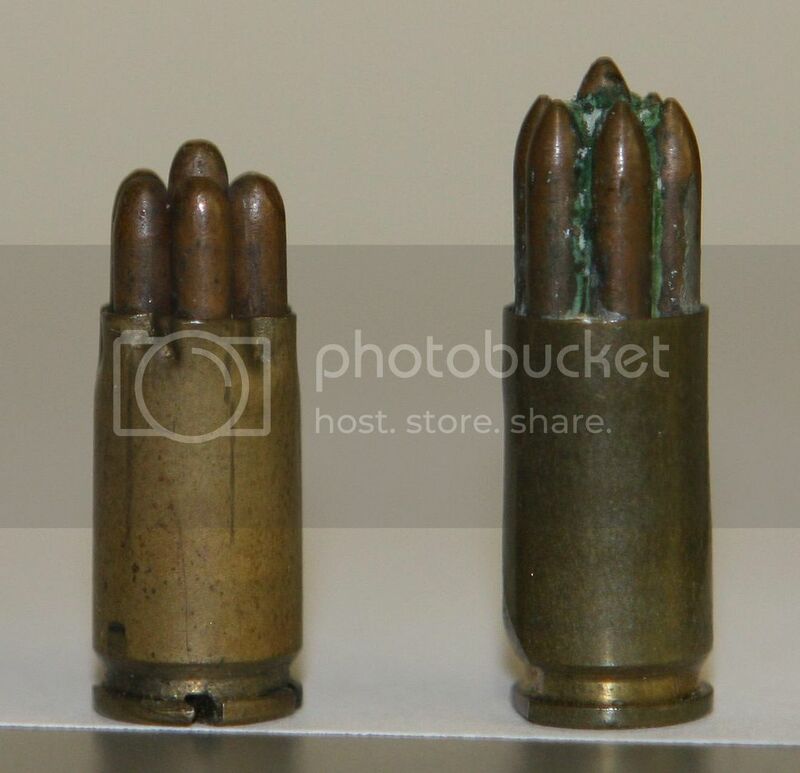 Both examples have the same small projectile bullet diameter ~0.175" (4.45mm) and the same positional placement (0.360" across the projectiles) which leads me to speculate they are parts of the same development program. This caseless item in the Woodin collection is not dated. The brass case appears to be a standard case with a typical large 0.210" (5.35mm) primer, but has a slightly thinner rim with marks on it that makes me think a headstamp has been turned off it. The lower 0.210" (5.35mm) of the case (and the rim) has been turned down to 0.455" (11.56mm) - probably to prevent accidental chambering of a .45 ACP case. The caseless example appears to have a simple flat copper primer in its base. The powder charge is 0.515" (13.08mm) in diameter and is 0.490" (12.45mm) tall. There was also a caseless example just like the one you show, but with a white colored powder matrix material. As far as I can translate from the original article, the common name for the cartridge type was the “Express”. Matt, thanks a lot for sharing these pictures. I am away from my notes but as I remember, Schirneker lived on the Canary Islands. He was a very prolific inventor and I think this is one of his earlier ideas. It was tested at both Colt and Geco/DAG. It required a modified magazine to keep the cartridges properly aligned so they would feed. The two Colt rounds I have (round nose and pointed bullets) have the beveled side like the WRA round pictured above, and were from the Colt test via a collector who was very close to Rob Roy, a senior guy at Colt. The DAG round I have came from the collection of a German forensic specialist who worked in a police lab. It has the two grooves on the head of the case for alignment. I think all three of mine have copper projectiles, as do the ones I have seen in the Woodin Laboratory. This was necessary so the projectiles could bend as the went around the curve in the outer circle of barrels. 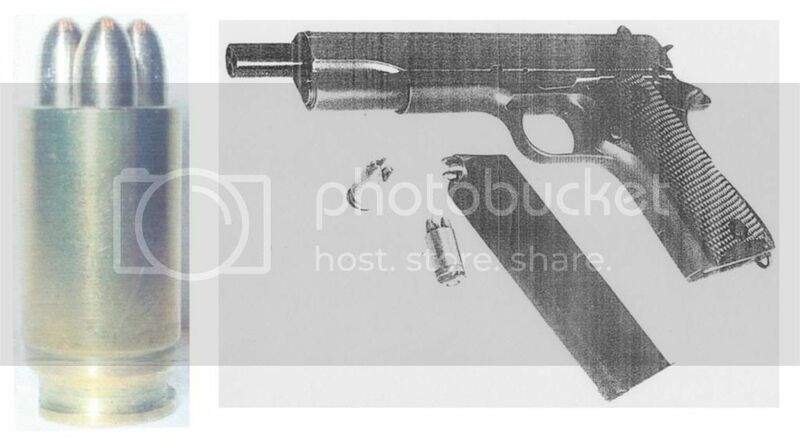 The test gun at Colt was a Luger pistol, and I believe the DAG/Geco test was also done with a Luger pistol. I don’t know the reason for the ports in the barrel, and can only speculate on what they might be for, but I’d rather hear others opinions. Ibelieve the bullets on the far left and third from the left were for the 45 ACP case but I have never heard of a weapon in that caliber. I was told the projectile on the right above the case head was for a drill round. I was also told that the intention was to scale this concept up to an assault style rifle. Finally, I was told this system didn’t give impressive results, particularly with regard to probable wounding effects. Do I see it right that #5 from left is a 7.65x17SR (.32 ACP)? It looks like it, but I can’t remember any discussion of a 7.65B in this load.